•TEV-LB0: carries 128x64, black/white WINSTAR WG12864A LCD panel (SAMSUNG S6B0108 controller). 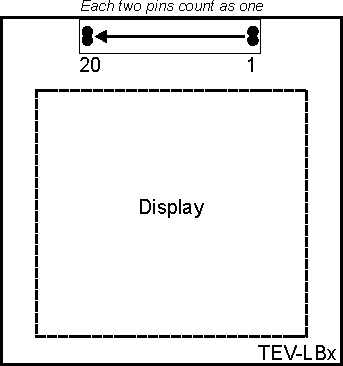 •TEV-LB1: carries 128x96, 4-bit RITDISPLAY RGS13128096 OLED panel (SOLOMON SSD1329 controller). •TEV-LB2: carries 176x220 AMPIRE AM176220 TFT panel (HIMAX HX8309 controller). You can choose what display board will be installed on your EM1000-TEV. See Ordering Info for details. The TEV-LBx boards are connected to the TEV-MB0 motherboard through a 2x20-pin connector. Each two pins of the connector are combined together for better electrical contact. Therefore, the connector effectively has 20 lines.